The stars and stripes on the American flag reflect NASA's commitment to teamwork as the Constellation Program's Ares I-X test rocket roars off Launch Complex 39B at NASA's Kennedy Space Center in Florida. Liftoff occurred at 11:30 a.m. EDT Oct. 28, 2009. 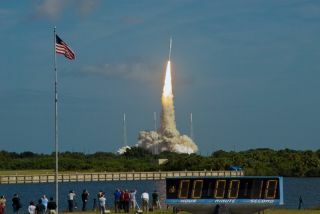 This story was updated at 12:50 p.m.
CAPE CANAVERAL, Fla. - A one-of-a-kind NASA rocket soared intothe Florida sky Wednesday in a brief but critical test flight of a new boosterslated to launch astronauts into space and, eventually, toward the moon. NASA's Ares I-X booster, anunmanned prototype of the planned Ares I rocket intended to carryastronauts after the space shuttle fleet retires, blasted off on anexperimental mission from the seaside Launch Pad 39B here at the Kennedy SpaceCenter (KSC). "I can't tell you how proud I am of all of ya," KSCdirector Bob Cabana told the launch team after liftoff. "That was justunbelievable, it was spectacular. I got tears in my eyes." After several false starts due to bad weather, the rockettook advantage of a brief break in the clouds to loft at 11:30 a.m. EDT (1530GMT). Foul weather and a series of unlucky events foiledits first launch attempt Tuesday. NASA required good visibility for thisfirst flight of the untried rocket. "Think about what we just did," said launchdirector Ed Mango after the liftoff. "Our first flight test and the onlything we're waiting on was weather. That says you all did frickin' fantastic,"he told the team. The rocket lifted off despite a bout of thunderstorms thatpassed over it Tuesday night. About 150 lighting strikes were seen to fall nearthe site, with four lightning impacts within about a half mile of the launchpad. The countdown toward liftoff was delayed Wednesday morning while groundcrews checked out the vehicle to make sure it suffered no lightning damage;luckily, the tests showed Ares I-X was safe to fly. "We looked at all the systems that could have beenaffected by this and all the data indicates that there was absolutely no realeffect," Ares I-X deputy mission manager Jon Cowart said Wednesdaymorning. The towering white booster rose into the sky toward theeast, peaked at about 28 miles (45 km) altitude, then dropped into the AtlanticOcean, with parachutes softening its fall. By all appearances, the launch ?which was aimed at demonstrating the rocket's design - was successful. The mission is expected to return a wealth of data -readings from more than 700 onboard sensors as well as visual evidence fromcameras on the ground and borne by flying aircraft. NASA engineers will poreover the information to study the rocket's trajectory and performance to helpconfirm and shape the design ofAres I. "It's a huge amount of data," said Bob Ess, AresI-X mission manager. "It's reams and reams of data that will take at bestmonths to go through and understand." The teams plan to release periodic reports over the nextthree months to share the results of the fact-finding test flight. "We'llcome back and tell the agency and the public what we learned from theflight," Ess said. Tuesday's launch plans were stymied by clouds, winds and thethreat of rain. If the rocket travels through high clouds it runs a risk oftriggering "trioboelectrification" - static electricity that couldinterfere with sensitive onboard instruments. In addition to weather concerns,a stuck cover on one of the rocket's probes stalled Tuesday morning, furtherdelaying the countdown, and a freight boat later strayed into restricted watersclose to the launch pad, thwarting one launch attempt. The Ares I-X rocket was composed of a real first stage, withfour tuna can-shaped solid-rocket segments and a dummy fifth segment ontop. It also carried a simulated upper stage and crew capsule to mimicthe intended size and mass of a full Ares I booster. At 327 feet (100 meters)high on the launch pad, it was thetallest rocket in service today, however brief its two-minute flightlasted. The solid-rocket elements were based on, and utilizedhardware from, the solid rocket boosters that help lift space shuttles intoorbit. After liftoff, the rocket's two stages separated as plannedabout two minutes into the flight when an explosive device along their boundaryfired on schedule. The first stage sank under parachutes to be collected byboats from the sea so that its onboard data could be retrieved. The dummysecond stage was left to sink into the Atlantic Ocean. Despite the apparent success of Ares I-X's flight, theultimate future of the Ares I rocket is uncertain. The booster was originally designed to replace the spaceshuttles as a vehicle to ferry crews to the International Space Station. Butthe station is set to be de-orbited around 2016 and Ares I is not likely to beready before 2017, defeating much of its purpose, some experts have said. Last week, an independent review team appointed by U.S.President Barack Obama releaseda report detailing the status of America's human spaceflight program, andoutlined possible alternate visions for NASA's future. The president is currently reviewing the report and isexpected to make a decision soon about whether to proceed with theConstellation program, which includes Ares I, or take the agency in a newdirection. The report suggested that President Obama consider giving up on AresI and instead urging private industry to step in and design a low-earth orbitvehicle for humans. That way, NASA could focus on building a heavy-lift vehicleto take people to the moon and Mars. Despite the doubts hanging over the program, and the perhapsunfortunate timing of the panel's report being released less than a week beforethe Ares I-X launch, mission managers say they are focusing on the task athand. "The timing is what it is, but the test is significantand it's one that we fully back," said Doug Cooke, associate administratorof NASA's exploration systems. Mission managers said that even if NASA does not go forwardwith Ares I, Tuesday's flight test provided useful data, not just about thatparticular rocket, but about the process of designing and building new rocketsin general. "The data were going to get and the objectives we'regoing to get are really germane to a whole class of launch vehicles," Esssaid. SPACE.com is providing full coverage of NASA's Ares I-Xtest flight with Staff Writer Clara Moskowitz in Cape Canaveral, Fla., andManaging Editor Tariq Malik in New York. Clickhere for mission updates.